After being so disappointed by Nicki Trench's "Complete guide to Knitting and Crochet" it was a very pleasant surprise to flip through this well presented and much better written crochet book which she published last year. Having a different publisher seems to have made a world of difference to the finished result with it having a clear layout, lovely photographs and being obviously much better edited. 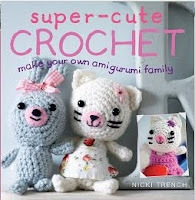 Each pattern has a little story behind it which draws you into the designs and makes you want to start creating your own friendly amigurumis which will have their own little quirks and characters. The tiny details on each piece are so lovingly added that you are bound to fall in love, the tiny embroidered flower on the kitty shown on the front cover is a great example of this - and don't you just love her tiny little flower patterned dress? Most of the patterns will have some little added touch - a bit of ribbon on one or a little sewn head-band on another and proves that the details really do matter. Not too sure where I went so wrong here but this little guy is not my best work by far. I think I should have chosen a less garish colour for him and perhaps tried harder with the embroidery on the face... oh well, perhaps someone else will love him better?